I've been wanting to switch up my mantle a little for some time now, but I really haven't been sure of what I was looking for. Do I want bright colors? Do I want something darker and more Autumn-like? Do I have any clue what I'm looking for? 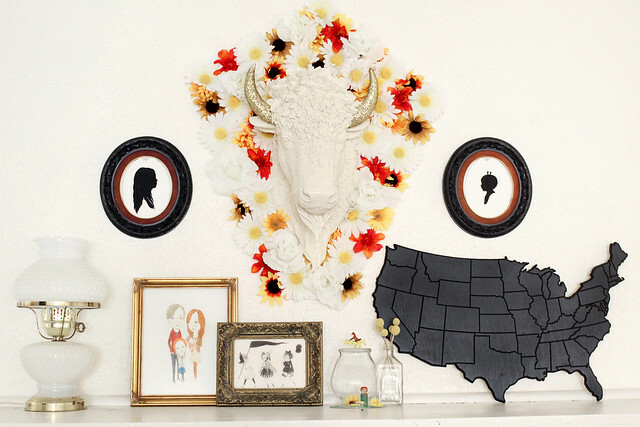 Enter: Kersey bison head from White Faux Taxidermy. Okay, now I know what I'm looking for. I really loved the Kersey in white, but I was afraid it would blend right in with my white walls. I decided to back the head in green velvet, but it ended up making the mantle much too drab. Some things are better in your head than in real life, you know? I marked that on my running list of DIY fails and opted for a more colorful and textured floral backdrop. I drew out and cut the shape I wanted from white foam board. 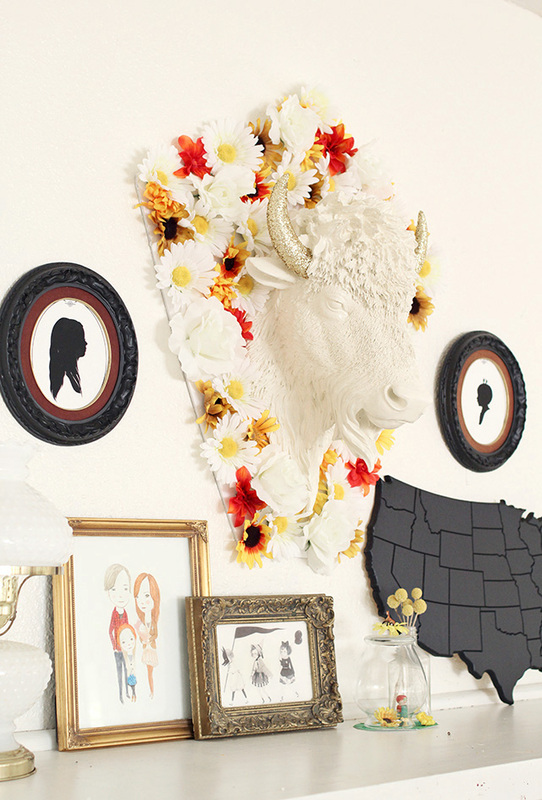 I bought a ton of flowers from the dollar store (much more cost effective than most craft stores) and hot glued them around where the bison head would sit. I was careful not to get any flowers under him because he needed to sit flat against the board. In the side view photos you can still see the white board, but with the way our living room is laid out, you don't really see it in real life. Check back a little later for a chance to win a mini version of the Kersey for your home! Oh my! So fun and unique! 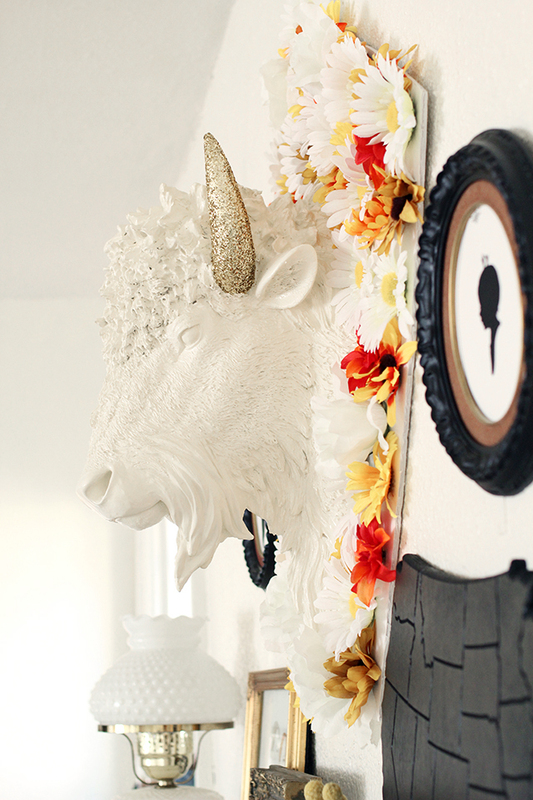 I love that it doesn't feel like there's a bison head staring at you every time you sit down in your living room! ;) So cute! Oh my gosh! I'm in love. That is great. White was definitely the way to go and that was a great way to make it pop. this is so awesome. I am moving out in a few weeks and I love getting ideas from other bloggers on how they style their homes...I can't wait to use some of these ideas in my own place soon! This whole project looks awesome! I LOVE this! The flowers make it so bright and pretty. Job well done, lady! Love this!!! It just too cute! I love him! He looks like he's frolicking through a meadow of flowers! 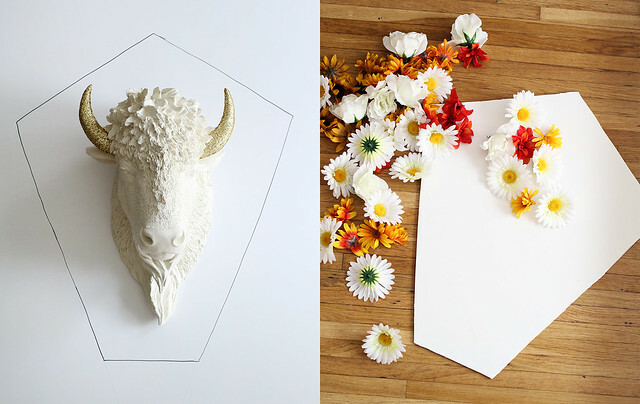 OBSESSED with white taxidermy, more importantly The Alberta Bronze Bear Head. Creative idea with the flowers. I'm going to try this with a few frames. Thanks!